i can post instructions if anyone's interested, i'm sure the technique could be used for any type of frilly skirt, really. that is so beautiful!! Well done! I wish I could flamenco- I do more of a "Flamingo" on the dance floor. Really it is a stunning skirt, did you sew this with no pattern? i love that skirt! it's beautiful!! i love the polka dots too! I'm also interested to know if you did that without a pattern? I LOVEEEEEEEEEEEE it! Ohmigod! That is so cute! And I'm not just saying that because of my addiction to polka dots! thank you kindly for all the compliments! i did use a pattern, made to my measurements a couple of years ago by a former flamenco teacher of mine (very luxurious, eh?). 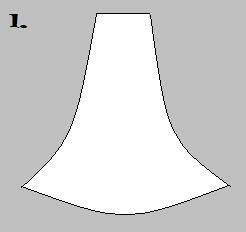 however, since the pattern is very simple and consists of only two parts, i'm sure it would be fairly easy to just make one. here's my attempt of explaining how it's done. 1. the skirt itself is made of six identical pieces, something like my sorry excuse for a drawing above. determine how wide the top of the pattern needs to be by dividing your waist measurement by six. the length should be measured from your waist to your mid-calf. mine was 30 inches long, 6 inches wide at the top and 31 inches wide at the bottom. you can modify the length and the width according to the kind of skirt you want, of course. then just sew the pieces together to make a skirt. using interfacing on the waistline is a good idea – it's better to make it sturdy because the skirt will be quite heavy. i actually used a long rectangle of fabric for the waist to make it more structured. remember to leave an opening at the top of one of the seams for a zipper. 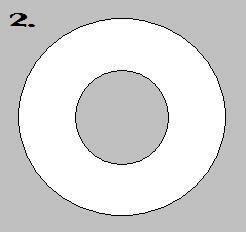 2. for the ruffles, the easiest way is to cut a number of circles with a hole in the middle. mine were 25 inches in diameter, with an 8-inch hole. how many circles you'll need depends on how wide your skirt is. i think i used seven and a half for just one layer of ruffles. 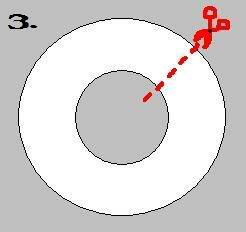 3. cut the circles open as shown in the picture, and sew them together to make a long chain. then sew the chain(s) on the hem, right sides facing each other. making the skirt was not at all difficult, but it did involve a lot of sewing – the hemming alone took me two days! if you want a full-length, full-width flamenco skirt like mine, you'll also need a lot of fabric. i hope this makes at least some sort of sense to you. happy hemming! could i do that but make the skirt shorter? hmm.. i would think so. the hottest ugly chick in the world. that's adorable! i am like in luv with that skirt! and the polka dots are to die for! 2 cute! very nice!!! 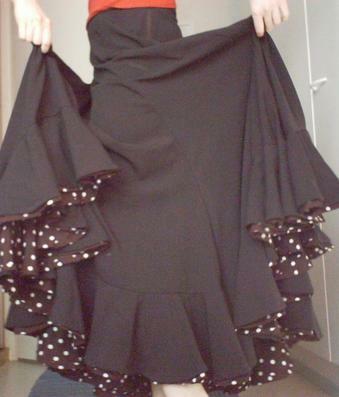 I took flamenco lessons for 1 year... had the shoes, the castanets, never got a decent skirt. hope you'll make one with lots of ruffles in red with the polka dots one of these days... they look fabulous on a dancer! Wow, awesome enough that you do flamenco, but making your own costumes, even better! The skirt is lovely! Do you perform in competitions? I had a friend that did, but couldn't ever do many because of the cost of her costumes. You did a phenomenal job!